What is it with Image and their incredible storytellers? I sat down and read this 40 page mammoth #1 not once, but twice. That’s 80 pages of reading for the math challenged folk out there (not judging). The book starts out with a cold intro the involves three people getting killed by nitrogen. No guns. No bullets. Nitrogen. The guy cold cocked these people. This introduction should feed into a dark brooding title sequence with 80s retro titles. But it doesn’t. This isn’t TV – its a comic book. What I’m trying to say here is while the base concept here is pretty formulaic, its a well made book. The art style is incredible. Bengal (so cool they only need one name) has a very intricate and colourful style. There are times where there is no dialog at all and yet the story moves along at a constant pace. That’s how well the story and the art mesh together. And while the lead character, Glory, is generally doing bad things for money: you empathize with her situation with her father and his health. 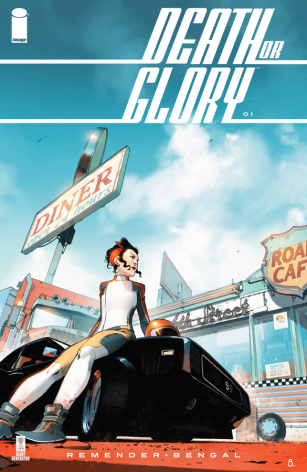 If nothing else, pick up Death Or Glory because its a great value and is good as a standalone story. However – you may get caught up in Glory’s plight and want more. And that’s a good thing.